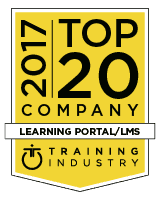 October 23rd, 2017 – Xyleme is honored to be named one of Training Industry Inc.’s 2017 Top 20 Learning Portal/LMS Companies. This is the sixth consecutive year that Xyleme has been named. Xyleme made several exciting advances to their learning portal which contributed to the recognition from Training Industry. Xyleme’s Content Delivery Service (CDS) now includes a Tin Can–compliant LRS that tracks how users interact with content, regardless of device or applications used. Another new feature added to CDS is a key integration between courses and the LMS. Courses authored in the Xyleme platform automatically load into CDS and are available on the customer’s LMS, real-time. Training Industry Inc. provides information, insights and resources needed to more effectively manage the business of learning. For their 2017 Top 20 Learning Portal/LMS list they selected the leading companies that demonstrated excellence in many areas, including the quality of the learning portal and the administrative features and industry innovation and impact. To see the full list of 2017 Top 20 Learning Portal/LMS companies visit, click here. Xyleme is honored to be recognized by Training Industry Inc. and will continue to be an innovative leader in the training industry. Xyleme is the Leaning Content Management System (LCMS) of choice for the visionaries who understand that learning content is a corporate asset. These visionaries are looking for innovative ways to change the way learning is created and delivered. Our platform is for companies that have complex content, helping them create, publish and deliver learning content more efficiently. Xyleme is headquartered in Denver, CO, visit Xyleme.com for more information.